April 10, 1990: This is what happens when you unfurl a massive parachute in the world’s largest wind tunnel. The Pioneer Aerospace Parafoil, also known as the Advanced Recovery System II, was tested at the 80x120 Foot Tunnel at NASA’s Ames Research Center in Mountain View California. The facility is approximately 24 meters by 36 meters, making it the world’s largest wind tunnel, and even then it was too small for anything but a scale model of the parachute. The aerodynamics test collected data on lift, drag, and pitch at angles from zero to stall (0° to 10°) used by air drops in gliding flight. An extended secondary test collected the same data during a flare maneuver at various trailing edge deflections and angles of attack. 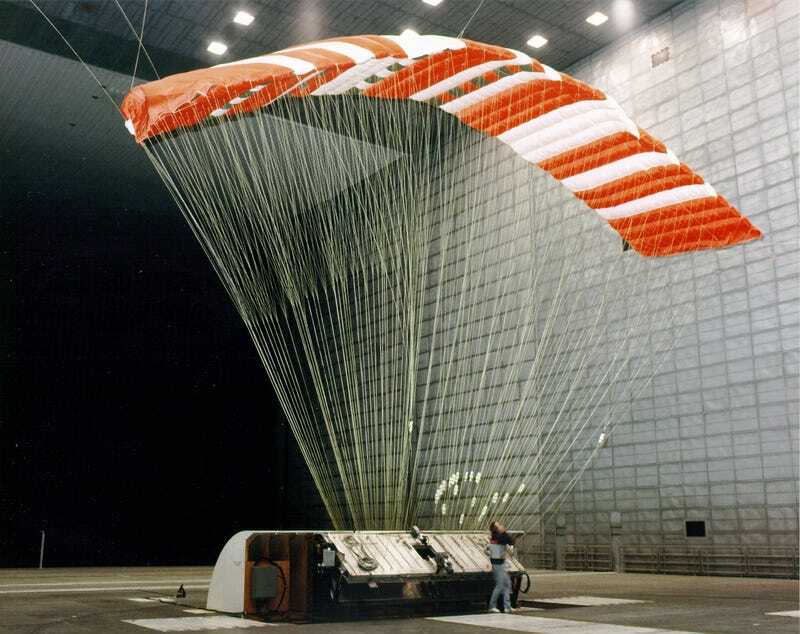 The recovery parachute was under development in 1990 to increase the potential payload weight of future missions. Read the full test report here.